I decided on this project because I ended up not purchasing the RV with the fan system to adjust (someone else keeps buying them before I can), and because the nice fan at my parents house, they didn't want me to keep messing around with it. So, here we are with recording the temperature of my jeep on the soon to be cold days of winter. The story (recently rebooted because other things didn't work out) is that I remembered how much I dislike a cold car, especially when it surprises me. The steering wheel is of particular importance because of how cold it is when gripping. I need a system that will show the temperature inside the vehicle so that I can decide if a light pair of gloves will need to be brought out. To solve this problem a temperature sensor will be built and power by the car's dc outlet. 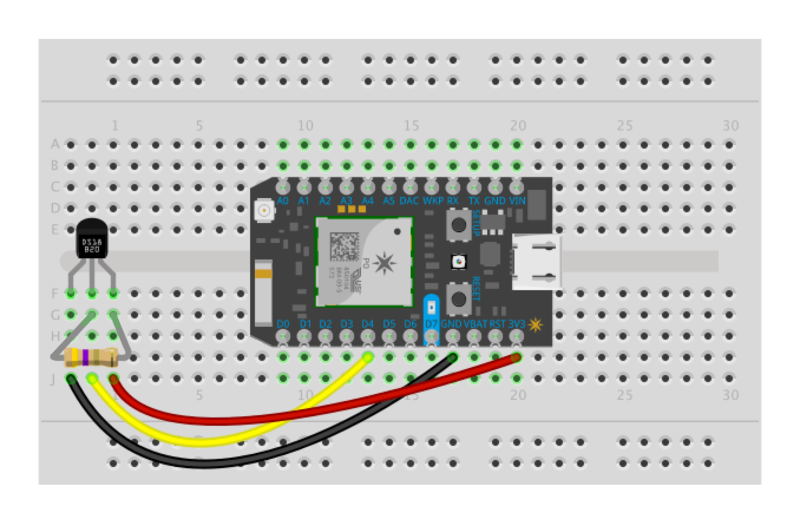 This sensor will publish the temperature to particle.io. To display the temperature in an easy to read fashion so that I don't have to look at my phone's program to quickly understand my car's temperature situation. Another particle will subscribe to the publishes of the temperature sensor on line and update the circuite to display the temperature on the OLED display. The image below is the schematic of the wiring for the Oled screen. Making sure which Oled screen you have is very important because their pins vary from each model. 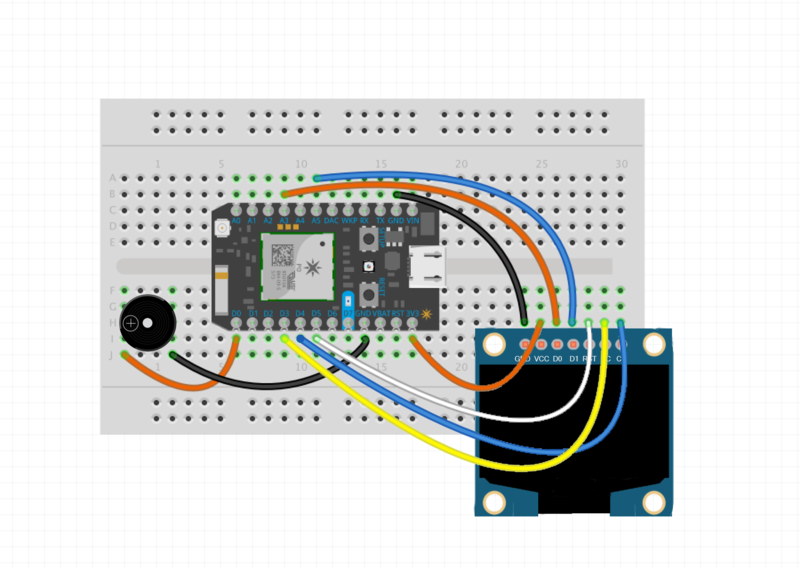 The next schematic is the wiring for the thermometer. As you can see, it has a 4.7k Ohm resistor. But I used a 10k Ohm resistor because it is within acceptability. Shown below is the graph from the logging file of the temperatures. As you can see there is a spike for no apparent reason. Overall the project has turned out well. Shown below are two recordings during a cold morning showing 34 degrees Fahrenheit. The Particle cloud is published with IFTTT. I want to take some time to thank the particle guys; their tutorial was very well done. This is the lcd display connection. I used it to display the temp sent from my temp recorder in the car. This is the diagram for the temp measurement. I used it outside in my car where it can stay all night and it will send back temp info. NextBus Public XML feed, which must be set up first along with the webhook. See http://docs.particle.io/tutorials/topics/maker-kit to learn how! so make sure to add it via the Libraries tab in the left sidebar. String carName = "The Jeep"; // name of your bus -- FILL THIS IN! // This is the handle for subscribing to get temperatures. // put the incoming data (the XML page) into a string called "str"
This will record the temperature and send it to the cloud where displayer will grab it. It also uploads it to my good drive's exel page for graphing and analysis. reads the temperature and outputs it from known device types as it scans. D3 - 1-wire ground, or just use regular pin and comment out below. D5 - 1-wire power, ditto ground comment. A pull-up resistor is required on the signal line. The spec calls for a 4.7K. power it gets more picky about the value. // Set up 'power' pins, comment out if not used! // what kind of chip do we have? // to already know their address to select them. // we might do a ds.depower() (parasite) here, but the reset will take care of it. Thanks to Adafruit and paricle's tutorial team.